This image of the far side of the lunar surface, with Earth in the background, was taken by the MoonKAM system board the Ebb spacecraft as part of the first image set taken from lunar orbit from March 15 to 18, 2012. The first student-requested pictures of the moon have been beamed back to Earth from a set of twin NASA spacecraft currently cruising in lunar orbit. 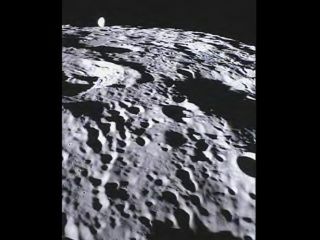 One of NASA's twin Grail (short for Gravity Recovery And Interior Laboratory) probes sent photos of the far side of the moon, as were selected by 4th grade students from the Emily Dickinson Elementary School in Bozeman, Mont. The students at Emily Dickinson Elementary School were the first to request images of the moon as a reward for winning a nationwide competition to rename the two Grail spacecraft, NASA officials said in an announcement today (March 22). The twin probes are now called Ebb and Flow. The MoonKAM project is also a collaborative effort involving undergraduate students at the University of California San Diego. "MoonKAM is based on the premise that if your average picture is worth a thousand words, then a picture from lunar orbit may be worth a classroom full of engineering and science degrees," Maria Zuber, principal investigator of the Grail mission at the Massachusetts Institute of Technology in Cambridge, Mass, said in a statement. "Through MoonKAM, we have an opportunity to reach out to the next generation of scientists and engineers. It is great to see things off to such a positive start." This image of the lunar surface was taken by the MoonKAM system onboard the Ebb spacecraft on March 15, 2012. The 42.3-mile-wide (68-kilometer-wide) crater in the middle of the image (with the smaller crater inside) is Poinsot. Crater Poinsot, named for the French mathematician Louis Poinsot, is located on the northern part of the moon's far side. More than 60 student-requested images were taken by the Ebb spacecraft from March 15 to 17, and were sent to Earth on March 20, NASA officials said in a statement. Grail is NASA's first planetary mission to carry instruments fully dedicated to education and public outreach, NASA officials have said. The photos will be taken as Ebb and Flow fly just 30 miles (50 kilometers) or so above the lunar surface. On the MoonKam website, middle school students can select areas on the lunar surface and submit image requests to the so-called MoonKAM Mission Operations Center, which will be monitored by students at the University of California San Diego. The requested images will be beamed back by the Grail probes and posted onto the MoonKAM website, where students will be able to examine the different surface features in their selected regions. More than 2,700 schools spanning 52 countries are already making use of the MoonKAM cameras. "What might seem like just a cool activity for these kids may very well have a profound impact on their futures," Ride said in a statement. "The students really are excited about MoonKAM, and that translates into an excitement about science and engineering." Ebb and Flow were launched into space in September 2011. The $496 million mission will study the moon's composition in detail and construct precise maps of the lunar gravity field. The observations will help researchers paint a clearer picture of the moon's formation and evolution, and will also shed clues on how Earth and other rocky planets in the solar system formed. NASA recently announced that the three-month-long Grail mission will be extended for another 90 days or so.